A new book about the experiences of a Far East Prisoner of War is being launched in London on Tuesday 28 July, with 30% of the proceeds going to national charity COFEPOW. The launch of Benedict’s Brother and the Benedict’s Appeal takes place on Tuesday 28 July in London, in conjunction with COFEPOW, at Foyles bookshop and the Victory Services Club. The charity’s supporters and all those interested are invited to go along. 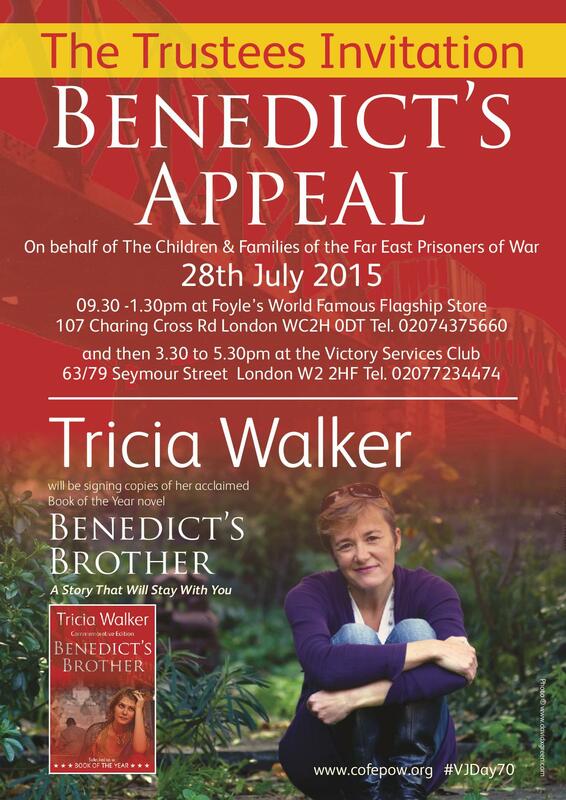 The acclaimed “Book of the Year” novel by Tricia Walker is based on the story of her great uncle who was a Far East Prisoner of War and Tricia has kindly agreed to donate 30% of the book and film proceeds to COFEPOW (Children and Families of Far East Prisoners of War). COFEPOW is a national charity dedicated to to keeping alive the memory of Far East Prisoners of War and raising awareness of the suffering they endured. The event takes place from 9.30am to 1.30pm at Foyles on Charing Cross Road, and then from 3.30pm to 5.30pm at the Victory Services Club on Seymour Street. 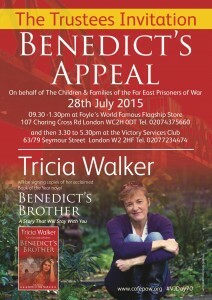 This entry was posted in Charity, COFEPOW, Events, News and tagged Benedict's Brother, book launch, COFEPOW, London, Tricia Walker on July 21, 2015 by Ethos public relations news.